A constellation of 20,000 cellphones illuminated the Las Vegas night. It was one of those special concert moments that stick with you like a sweet melody. As is their tradition, country stars Big & Rich had invited military members onstage during their set to lead everyone in a stirring rendition of God Bless America. Accompanied only by Rich’s acoustic guitar, the crowd at the Route 91 Harvest music festival sang as one voice. God bless America. It was an awesome sight. Then, just a little more than an hour later … well, you know what happened. Save a Horse (Ride a Cowboy). That title, from Big & Rich’s second single, has got to be one of country music’s best ever — and Hillbilly Jedi, their 2012 album, isn’t far behind. Catchy as they are, those appellations also tell you almost all you need to know about the Big & Rich ethos. Those, and maybe a few from their new album, like We Came to Rawk, Funk in the Country and the title track, Did It for the Party. But there’s another title that reflects a more serious side to Big Kenny Alphin and John Rich, who’ll serve as grand marshals for the Dec. 9 Winterfest Boat Parade. It’s their 2006 hit, 8th of November, a fiery account of a Vietnam War ambush that on that date killed 48 American soldiers — originally told to the musicians by the Vietnam vet who was one of its few survivors. Two months ago, the legacy of that song cast a tragically ironic shadow on the Las Vegas night. After the Oct. 1 massacre, the worst mass shooting by a lone gunman in U.S. history, the duo put out an appeal via social media for a campaign that’s so far raised over $11 million for the victims. They also were invited back to the city a couple of weeks later to headline “Vegas Strong: A Night of Healing” to benefit the Las Vegas Victims Fund. 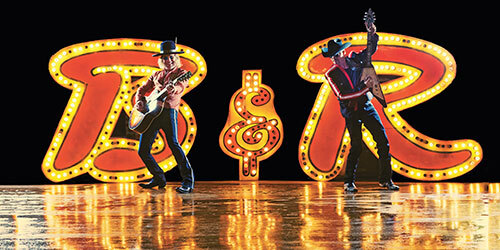 Since their 2004 triple-platinum debut, Horse of a Different Color, Big & Rich have effectively managed to stretch the country genre without bucking countrified traditions. Especially with the new album on their own label, they’ve perfected a rowdy brand of street-kickin’ urban country that on a few numbers approaches what Aerosmith just might have sounded like had Steven Tyler started out in Nashville instead of ending up there. More rock-country than country-rock — a whole lot more Hank Jr. than Hank Sr.
It’s turned out be a slam dunk. In September, their new single, California, started climbing the charts after Did It for the Party, their sixth Top 10 album, debuted at No. 2 on Billboard’s Top Country Albums — their best start since Between Raising Hell and Amazing Grace launched at No. 1 in 2007. On the all-genre Billboard 200, the new album kicked off at No. 9. The band’s party-hearty image and their affectionately nicknamed fan “Freak Parade” are a good fit for the floating party that is the Winterfest boat parade. C&S: When did you start wearing the top hats? BK: I’ve always worn hats, but that top hat was given to me in 2002 in Deadwood, S.D., by a man by the name of Niles Harris. He was the bartender of a juke joint there and it was the first time that John and I ever had Big & Rich listed on a ticket. He just turned out to be one of the coolest guys ever. He’s the fellow that told us the story of the 8th of November, which is a very powerful song that’s been in our repertoire ever since then. And then we start to get to know him and he tells us that story and a year later we end up writing that song and it’s still one of the biggest songs we do in our live shows. It’s been such an honor to play it and honor all of our veterans out there — it’s just been a powerful thing. And I’ve been wearing top hats ever since then. I’ve got one I’ve been wearing that I just had a friend make in Nashville that’s kind of a combination between a top hat and a bowler. C&S: When the shooting started after your performance at the Las Vegas festival, you were at John’s club not far from the venue. I understand that at one point a SWAT team came at you? BK: I had gone out back to the bus to get my phone to text my wife. When I stepped off the bus, there were SWAT guys coming down the street. They thought it was possibly multiple shooters in the city, so anything that had high walls or glass on it, they had SWAT out on the streets checking it out. At first they were cautious at anything they saw. It was a very tense moment but they immediately recognized me. I said, ‘Hey, it’s Big Kenny — yeah, we just played up there, man.’ And they were all cool. I said I haven’t seen anything come down here armed in any way, shape or form. I hung out with them until we got more of a clear sign. There was just hysteria, people running down the street at that point, running away from where the venue was. C&S: How do you feel that whole experience affected you? BK: You just keep your eyes open a little more vigilantly, but it’s not going to stop us from going out there and making the music and bringing the joy. I think it just makes us even more firm in our thoughts that fear is not gonna stop us from celebrating all the wonderful things that we have in life. You know, music’s a great common denominator that brings us all together. At the end of the day, we all sing together. We can’t let these kind of crazed people affect the blessings that we have. I think it’s just made us more committed to bringing the music, no matter what. C&S: Speaking of that, what was it like to return for the benefit concert just a couple of weeks after the shootings? BK: It felt great to go back, to just go there and tell all those people that we’re behind them 100 percent. Our communities are related in that all these performing artists come out of Nashville and you’ve got a city like Vegas that is known the world over as an entertainment mecca. So we’re gonna be there to support them. And meeting so many individuals — especially with all the emergency services workers, firefighters, police officers, troopers that come from everywhere — just telling them thank you. And just seeing the appreciation back from them, I think it made the bond between us all even tighter. The 46th annual Seminole Hard Rock Winterfest Boat Parade launches at 6:30 p.m. from downtown east along the New River to the Intracoastal and north to Lake Santa Barbara in Pompano Beach. An expected 1 million spectators will view the 12-mile spectacle, featuring the Grand Marshal Showboat with Big & Rich, The Galleria Mall Reindeer Barge and the Santa Showboat. The Grandstand Viewing Area is at Hugh Taylor Birch State Park. The Grand Marshal Experience will welcome the country music duo on Friday, Dec. 8, from 6-9 p.m. at the Seminole Hard Rock Hotel & Casino in Hollywood. For more information visit winterfestparade.com.